Is this twins? Looks like two seahorses in one sac. 6 weeks and 2 days. Was spotting, had an sonogram done, everything is ok but my sac looks like it has two seahorses in it. The tech never said anything but I would like someone's opinion. Comments for Could This Be Twins? 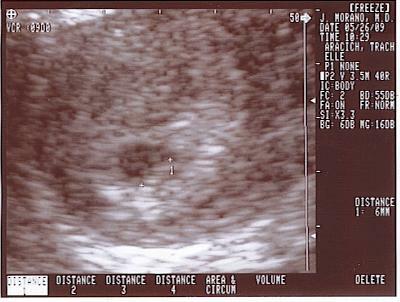 I am 9 weeks pregnant and my fiance saw two dark spots in the ultrasound... The doctor said they weren't at liberty to say anything... Could it be twins??? Probably not, to be honest. I can see the baby to the bottom right with the dots marking the fetal length, the 'seahorses' are just related to the plane of the ultrasound and resolution limitations. I agree, it does look like two. Please come back and let us know. I also am questioning my u/s pic.